Trombonist Fidel Fourneyron, a first-call player in France who has been a member of groups such as the Orchestre National de Jazz and Eve Risser’s White Desert Orchestra, first goes to Cuba in 2012, following in the footsteps of double bass player Thibaud Soulas. Without actually even knowing him that well, Thibaud is kind enough to give Fidel the address of his “Cuban family”, tells him about the kind of traps to avoid and puts him in contact with the "good people". Perhaps it is the predestination implied in the trombonist’s first name, but Fidel got completely immersed straight away. He meets Adonis, Ramón and Barbarito, percussionists from Osain del Monte, the rumba group. With them, he jams, he learns about batà. Fidel is fascinated by the religious ceremonies, with their traditional drums as the cornerstone. On the next trip, Fidel comes back to Paris with an idea in mind. 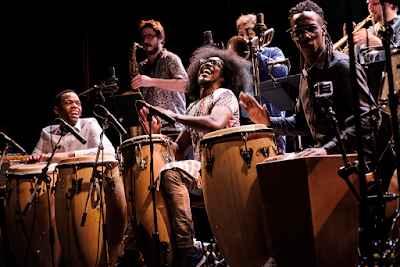 He and Thibaud Soulas put together a programme, and with the support of festival directors, notably Xavier Lemettre from Banlieues Bleues, he brings the Cubans to play in France. They tour between 2017 and 2018. The No Format label records them during the summer of 2018. Less experimental than the concerts, the album nonetheless has something really new about it. Cuban jazz pianist Alejandro Falcon has been responsible for rearranging the repertoire of Los Munequitos de Mantanzas for this group, and he explains why he considers that the melding of these two traditions works: "The fusion of guaguancó with jazz works because our music is of African origin and, like jazz, it has a philosophy of union, exchange and freedom, the improvisations and above all the rhythmic richness of these two genres." The basic idea is to be free of the constraints and predictability of Montuno. Because even if it is jazz, Latin jazz is basically dance music, with all the limitations that this implies. The question and answer structure specific to Afro-Caribbean music is preserved, except that the voices here are those of the wind instruments. There is just one track of sacred music on the ¿Que Vola? album, the introduction to drums from the Oro Seco is an ode to Chango (one of the divinities of the Yoruba religion), played by Ramoncito who defines himself as "son of Chango". Calle Luz, Fruta Bomba and ¿Que Vola? (based on a ‘columbia’ led by Adonis) are full of invention. Fidel Fourneyron enjoyed the jousting between brass and the batà players. "They were too strong for us!" he jokes. But the French jazz musicians do respond. With the freedom in the way they interpret, their inventiveness can allow them to escape the confines of the fixed tempo of the clave. Also, the idea of the trance, born of African rhythms, and an overtly Coltrane-an inspiration persists in the music too. And there are influences from lesser-known traditions too: Nganga for example, is inspired by the palo, Lyesa is another form of liturgy. Resistir is an epic work inspired by the Abakua tradition, through Machito. Spring 2019. The French musicians are getting ready to meet their Cuban friends. A new tour, several dates in France, followed by London and before long New York. These musicians are excited by the prospect of finding new audiences. There is a common desire to see their project evolve, to keep pushing back the boundaries.